This is an unused, factory fresh, genuine Burroughs C-2506-6 six digit B5750S Nixie tube type counter with memory a decoder driver circuit card assembly. It uses standard TTL (Transistor Transistor Logic) input logic signal. The high quality, fully loaded, factory built pc card has a 52 pin edge gold plated connector. The unit requires 5 Volt DC (Direct Current) and 200 Volt DC for its operation. It was made by the now defunct Burroughs Corporation Electronic Components Division (ECD Plainfield NJ) around 1968-1970. This unit is unused and in excellent working condition. 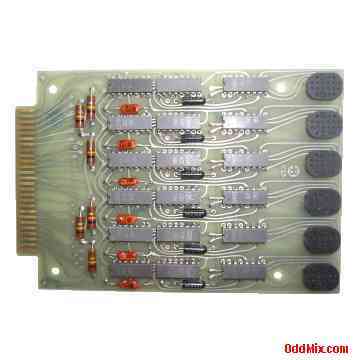 This card is a complete six digit pulse counter assembly. Only a time base circuit reqired to make it a classy frequency counter. Typical input toggle rate is 25 MHz. Excellent as a replacement, or for new projects. It can be used especially well for making a frequency counter, pulse counter or a simple DVM with a high quality fully assembled digital display. This is a real hard to find vintage collector's choice item. Only one available.